Hand-pulled some weeds: orchard grass, bittercress, spurge, and marestail; and some poa trivialis from nearby woods ... fed all those to the composter. Edit: Hand-pulled one poa annua that started to show a seed head. Last edited by Powhatan on Mon Feb 25, 2019 9:10 am, edited 5 times in total. @Green I noticed this clump with what appears to have a prominent mid-vein with two parallel veins and a boat tip. I wonder if this is some TBG characteristic HBG we discussed last month. It's even got some new growth coming out of the collar. Mid-vein with two dark parallel lines (veins). Underside with mid-vein and what appears to be two dark parallel veins. Boat tip blades. New growth coming out of the collar. Edit: Here's some KY-31 I thought were interesting. Located just outside the main lawn area. It was mowed to HOC 3.25" mid-Nov when the grass stopped (paused?) 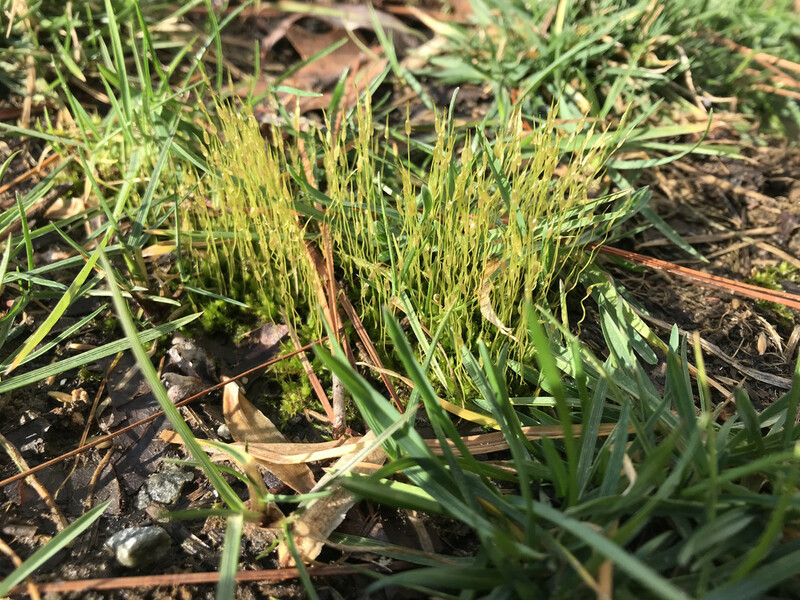 growing; I didn't cut it with the rest of the lawn when I mulch mowed the fallen leaves during late Nov. The deer apparently ate some of the top and left the sides, thus the side blades are longer than the top. After the snow in early Dec we've had some warm temps for several days and the grass responded. Same clump as above. There's new growth. Last edited by Powhatan on Mon Apr 01, 2019 5:20 am, edited 4 times in total. @Powhatan, I saw Bluegrass that looked like that a few months ago in my back lawn, and I honestly don't know why it looks like that. I had not planted HBG there. I wanted to photograph it but didn't ever get to. Glad you did. I suppose it could be HBG or TBG. But could it also be a reaction to the cold or something else? 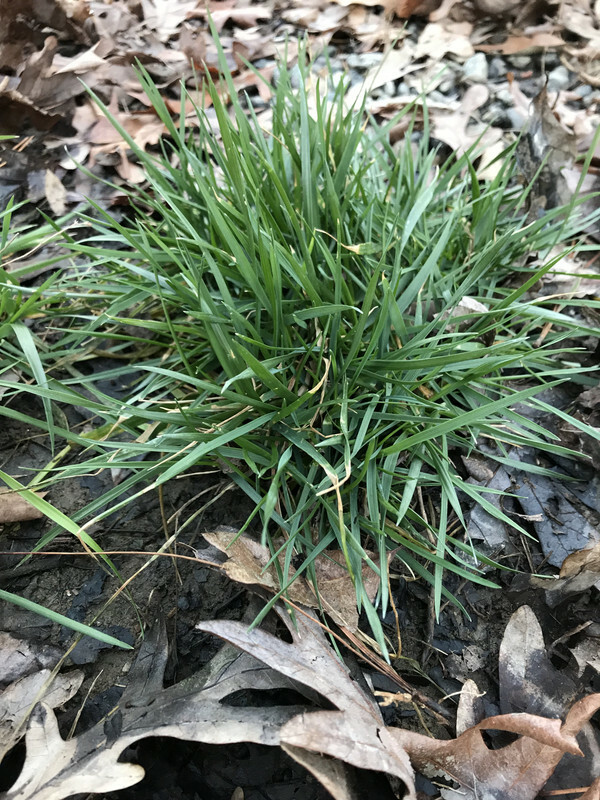 Its weird... it almost looks like a cross between KBG and Tall Fescue, which I think is technically impossible. I would cut it out, pot it indoors and try to grow it. And then maybe submit it to an expert or turfgrass breeder. That's what I would do if it were me. Or at least submit the photos. Speaking of crosses, a TF/PR cross is possible. They're doing it for forage already, and call it rye-fescue. I hope they start doing it for turf soon, too. That will be cool. 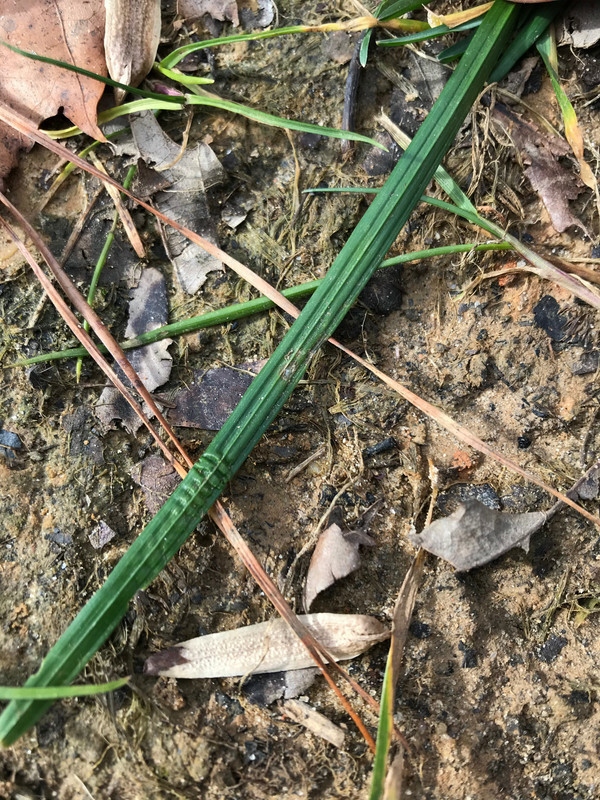 I've also seen some other cool stuff, like Tall Fescue that had alternating green and white veins. I think that must have been due to Tenacity a couple of months prior. But it's still not the typical reaction...usually the whole cross section whites if it's going to...and much sooner. Also watch that KY-31 plant for rhizomes in the Spring. It looks like it's going to start spreading a bit due to how the deer trimmed it. I think leaving the lower leaves longer and cutting the upper ones encourages spreading in Tall Fescues. 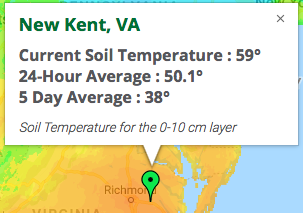 48 degree soil means you're definitely going to still have sporadic growth until the ground cools a bit more. We are at 40 and lower 40s here, and it basically doesn't grow at all. Maybe a little on a warm sunny day after rain, but that's about it. It still spreads underground a little, though. We are soon to get colder...tomorrow. Last edited by Green on Wed Jan 09, 2019 5:18 pm, edited 8 times in total. ... so let's walk down the back woods path to take a peek at the fresh water lake. The lake level is about a foot higher than average. The beavers have been busy. Last edited by Powhatan on Mon Jan 21, 2019 10:29 am, edited 1 time in total. 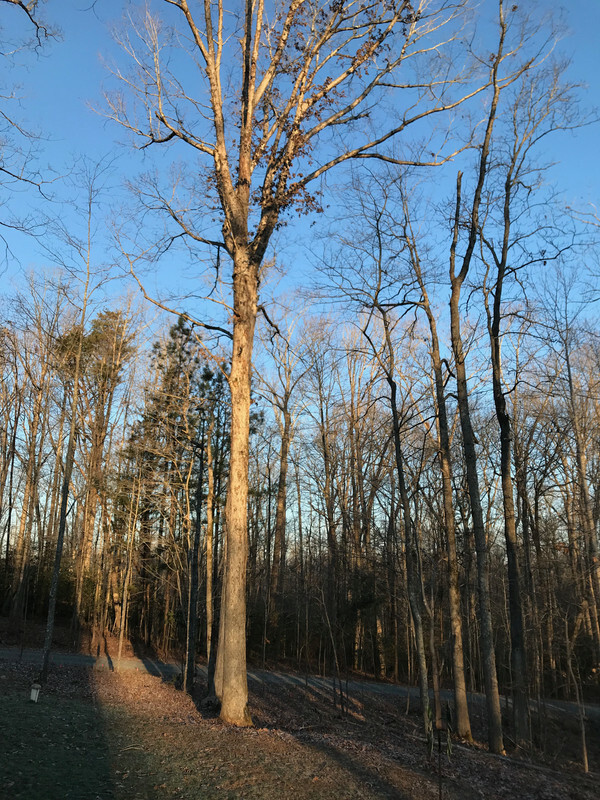 No wind, good day to fell this dead oak tree. I'll put a cable high up attached to a come along to pull down combined with a hinge cut at the tree base, so hopefully the tree falls away from house. 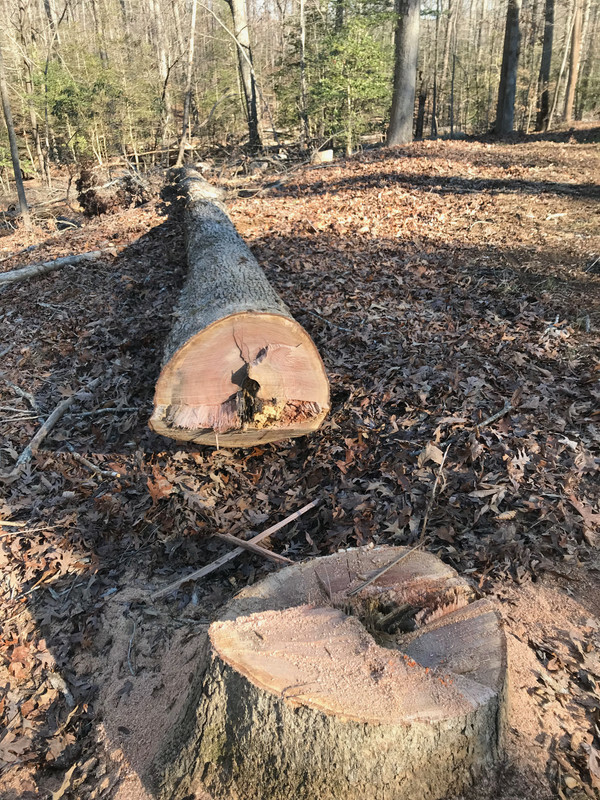 Neighbors will cut the trunk into fireplace length logs for their use. 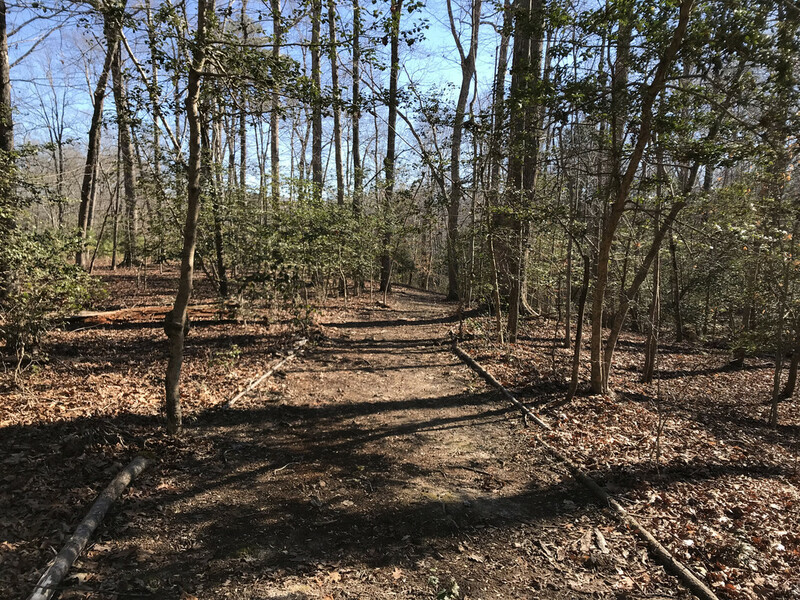 Last edited by Powhatan on Mon Apr 01, 2019 5:20 am, edited 1 time in total. Felled exactly where wanted it to go. Last edited by Powhatan on Sat Feb 02, 2019 10:44 am, edited 1 time in total. I plan to put down a winter dormant overseed later this month. Looks like I may not need a higher KY-31/TTTF mix overseed 8-10#/M rate, maybe lower 6-8#/M. Split the difference and do 8#/M. 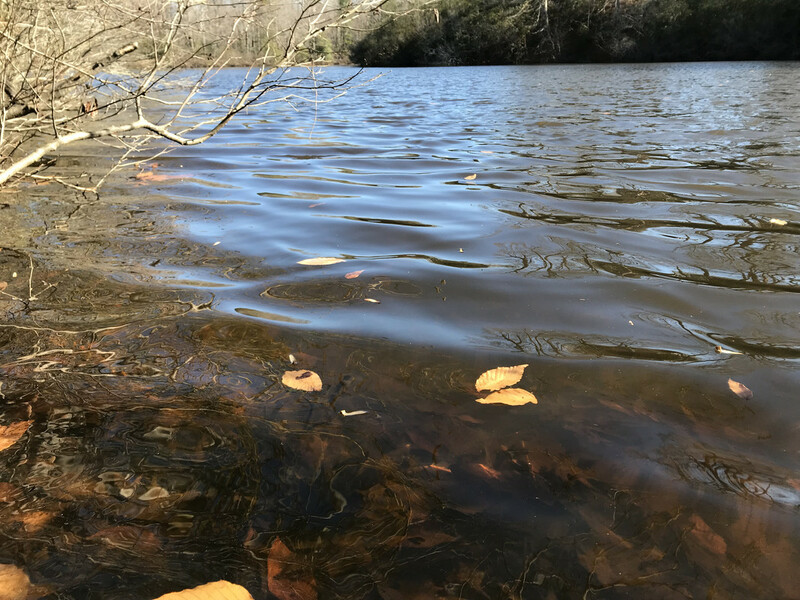 Last edited by Powhatan on Mon Apr 01, 2019 5:21 am, edited 3 times in total. 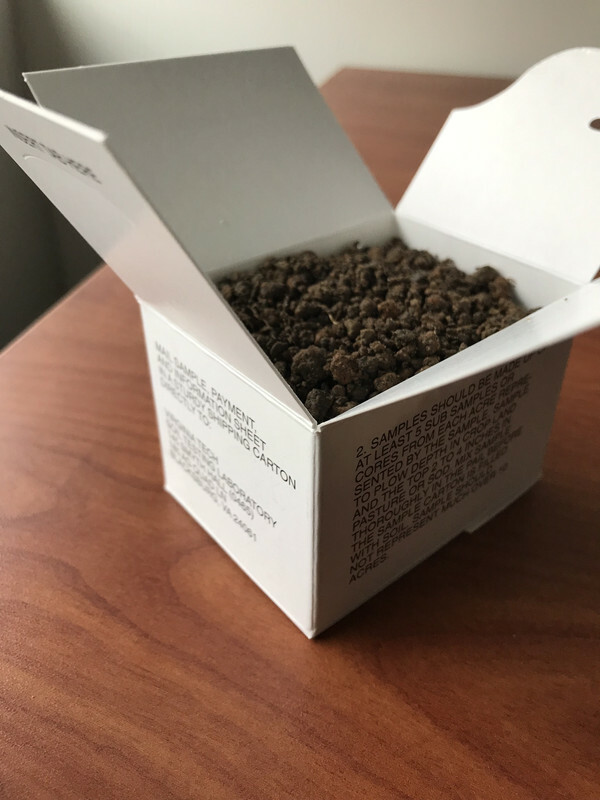 Mailed soil sample to Virginia Tech Soil Lab for testing. Hand-pulled some weeds: orchard grass and poa annua ... fed all those to the composter. 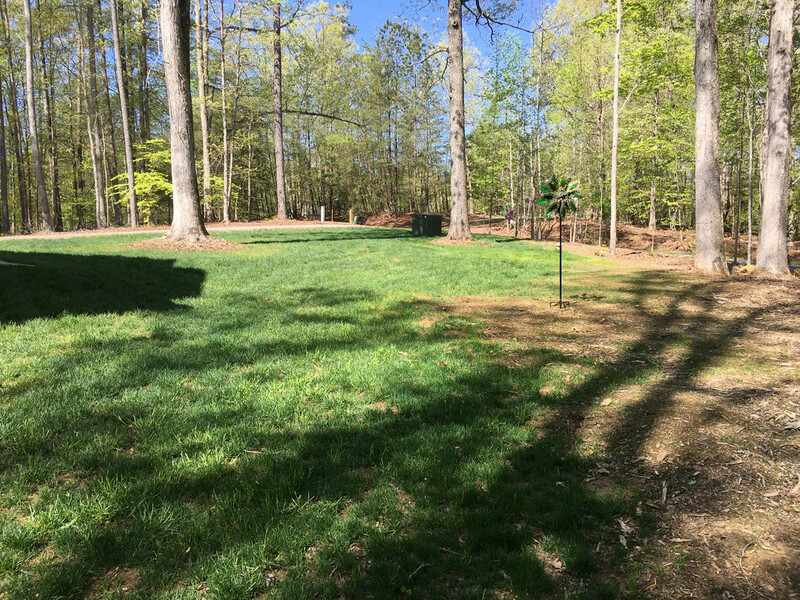 Late winter dormant overseed whole yard 8#/M - 75# DLF Pickseed KY-31 coated, 10# Scotts Southern Gold TTTF coated, and 10# Southern Belle TTTF. Soil temp 54F @ 2" depth. Last edited by Powhatan on Sat Feb 16, 2019 7:42 am, edited 5 times in total. Past few days been warm, so decided to send in a soil sample for testing. Soil temp 52F @ 2" depth. I took 2" depth cores from 10 random areas all around yard to make a composite submission sample. 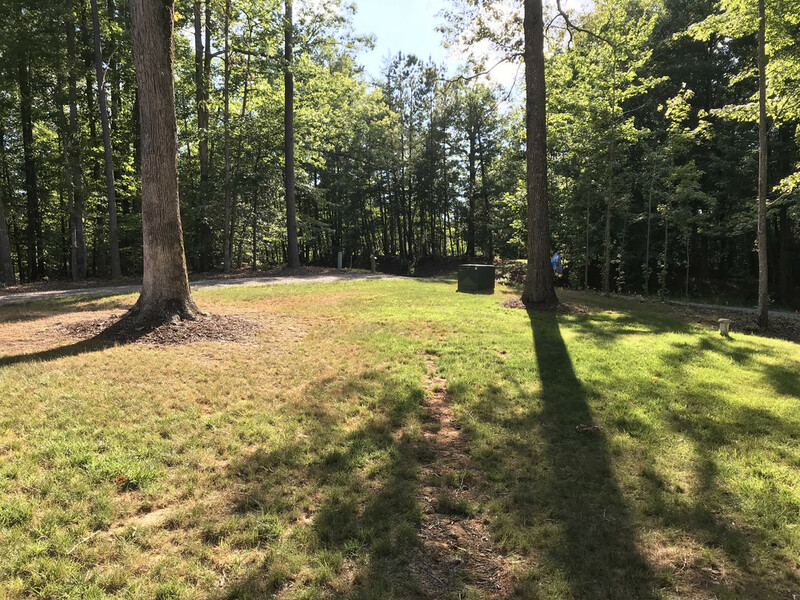 Last sample I submitted was back in 2017 which was the first year establishing the lawn. The actual 52F soil temp was lower than the current GreenCast reading, but very close to the 24-hour average temp. In about three weeks I'll probably need to put down PreM. The Forsythia bloomed in my area at the end of February according to my 2018 notes. March typically will have one or two cold snaps before the April green-up. 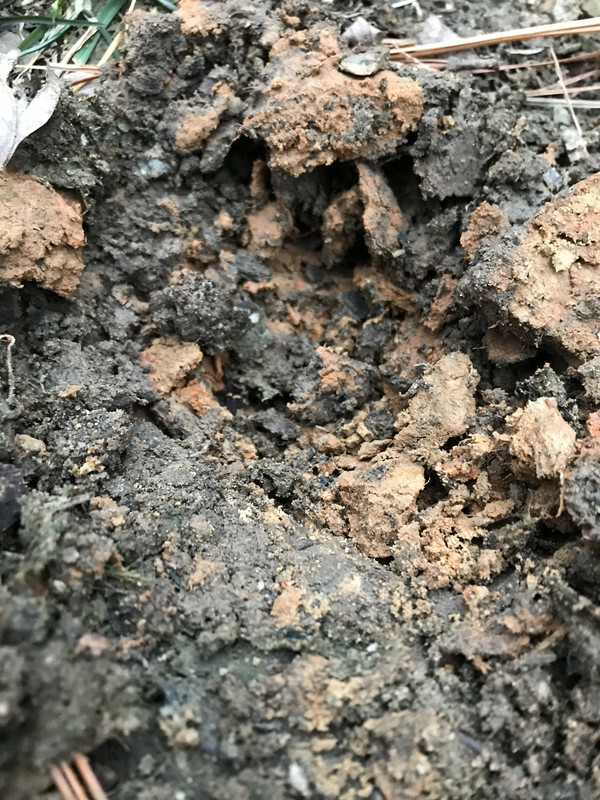 Most of the soil sample areas look like this. Box mailed to Virginia Tech soil lab. Paid for routine and organic matter tests. Last edited by Powhatan on Sat Feb 09, 2019 7:34 am, edited 3 times in total. Soil temp 45F @ 2" depth. I'll be overseeding the yard probably within the week or so. Air temps will be in 50s/30s with mixed days of sun and chance of light rain/snow showers. 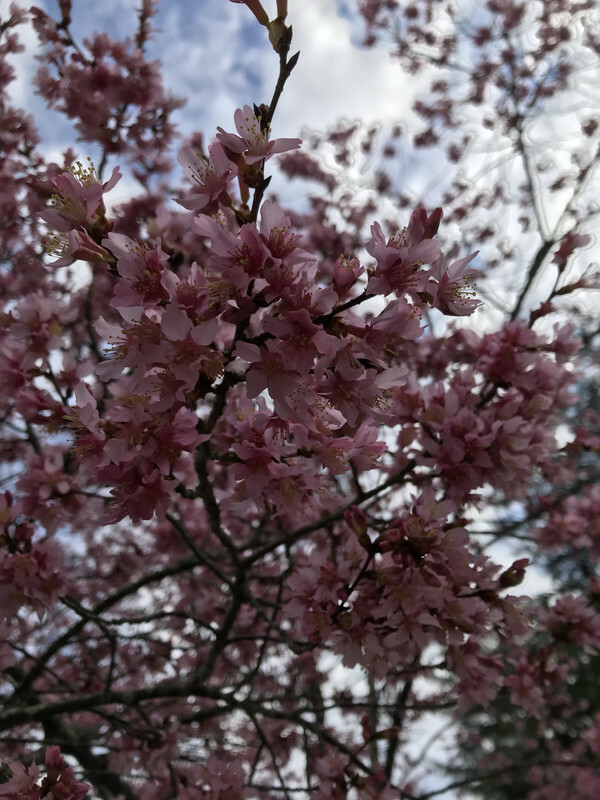 Cherry Blossoms making appearance. Past few days been in the 70s. Last edited by Powhatan on Wed Feb 20, 2019 8:42 am, edited 6 times in total. 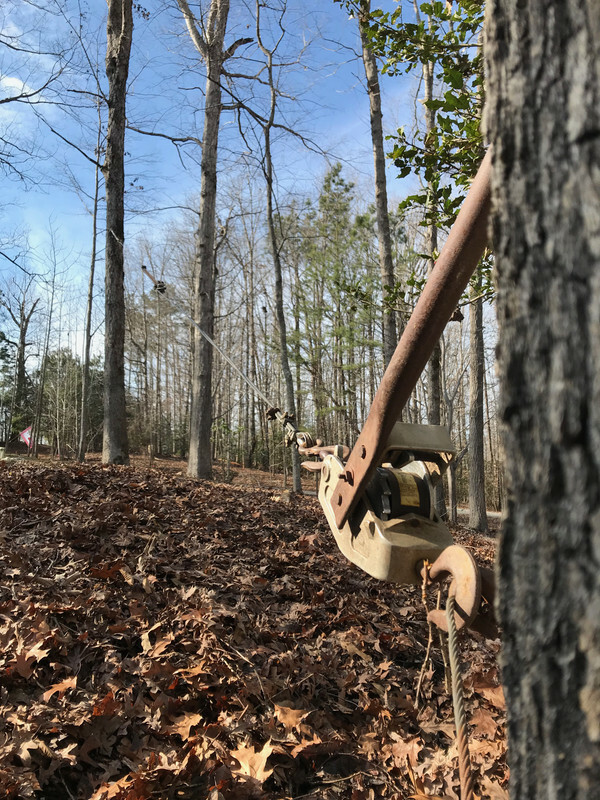 Late winter dormant overseed whole yard 8#/M - 75# DLF Pickseed KY-31 coated, 10# Scotts Southern Gold TTTF coated, and 10# Southern Belle TTTF. Pushed the seed into the ground using the riding mower's tires while broadcasting the seed. I kept a little of each seed type just in case I missed an area when seed starts germinating. Forecasted air temp 50s/30s with light rain/snow showers for the next ten days. Last year's germination occured on Mar 1. 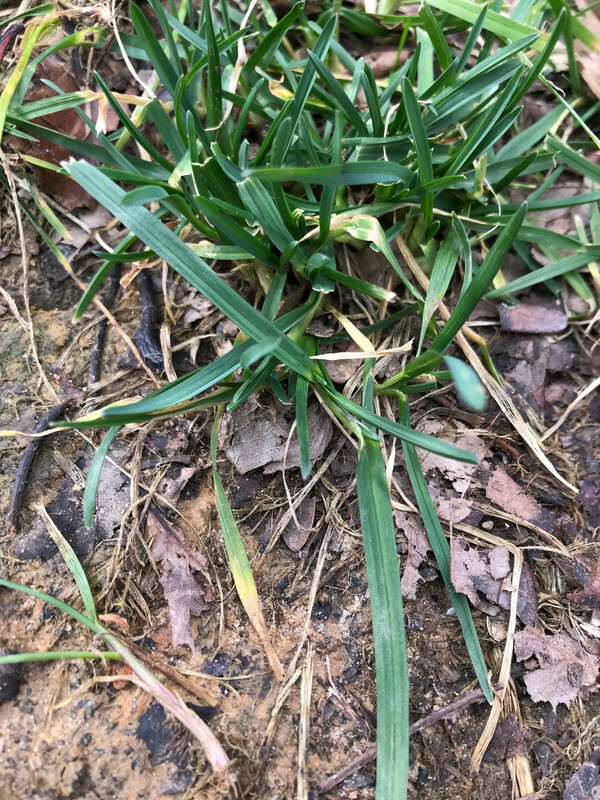 3rd year overseeding in late winter. 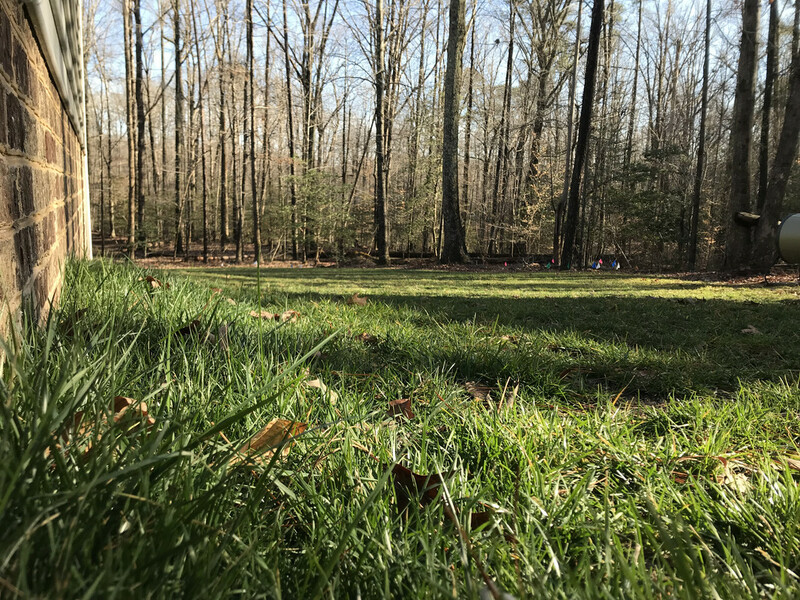 My property is surrounded by trees and in early spring there are less leaves and this allows maximum sunlight down to the entire lawn throughout the day. I don't irrigate; the late winter snow melt and early spring rains provide the needed water. 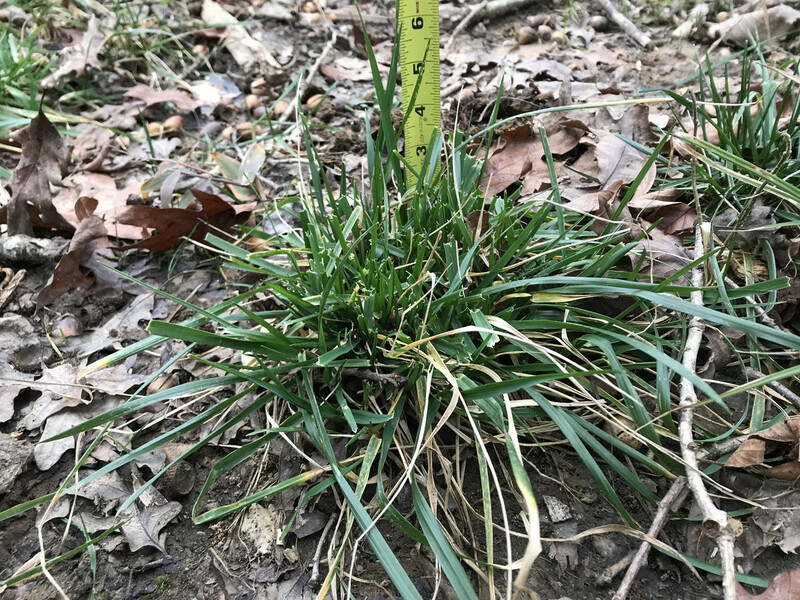 2nd year using KY-31 as the majority lawn grass. 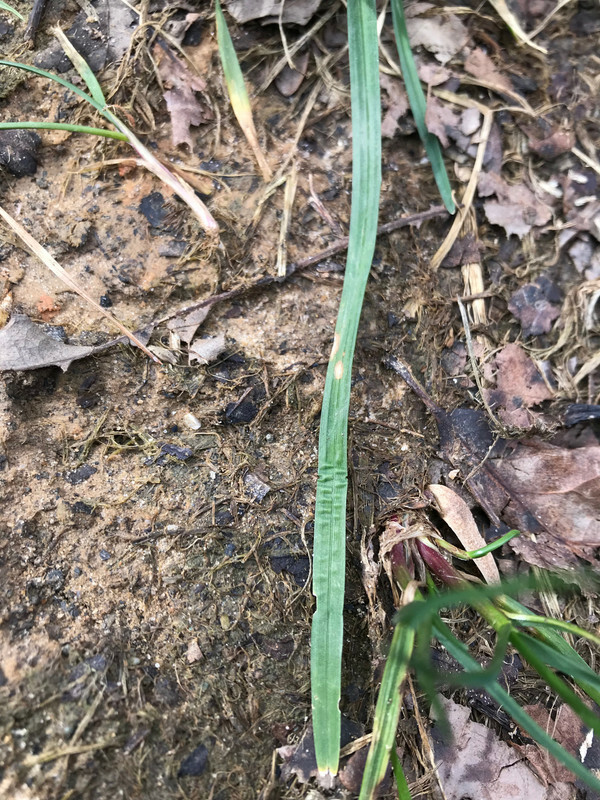 Last year I noticed a lot of KY-31 held green growth color for longer going through summer than the other grass types I have. Last edited by Powhatan on Wed Feb 20, 2019 8:44 am, edited 5 times in total. Below is what the front yard looked like going through last year using majority KY-31 seed for the first time. The front receives the bulk of the afternoon and early evening direct summer sunlight. 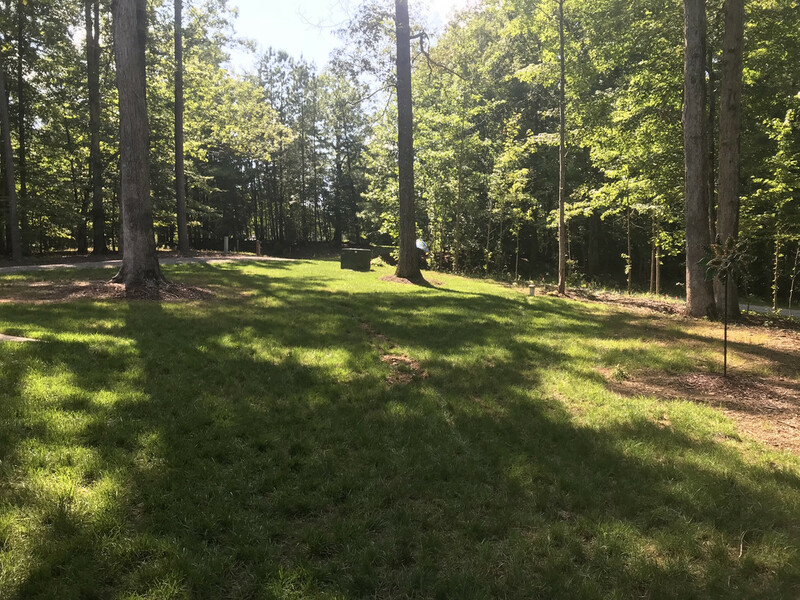 Apr 2018 - The light green grass in center right is around a water well pipe head, it is orchard grass that the home builder put down. The other light green stuff random around is annual ryegrass that was a KY-31 seed bag contaminant. Jul 2018 - Going though summer heat and no supplemental irrigation. Aug 2018 - After receiving rainfall. Dec 2018 - Light overseed done in Sep & Oct.
Last edited by Powhatan on Fri Apr 05, 2019 10:14 am, edited 4 times in total. The sun came out after a week of rain showers. Soil temps are still in the high 40s - 48F @ 2" depth. Weather forecast says another 10 days of 50s/30s. Probably mid-March I'll put down the 1st preM app (mesotrione). Then late April the 2nd preM app (dithiopyr). Intresting, the GDD Tracker also shows mid-March getting to be the optimum time to put down preM. That confirms what I was guessing. The grass is taller next the house. You would think the soil temp would be slightly warmer there, but no, it's the same as the measurement I took in middle of yard. The moss is very active. 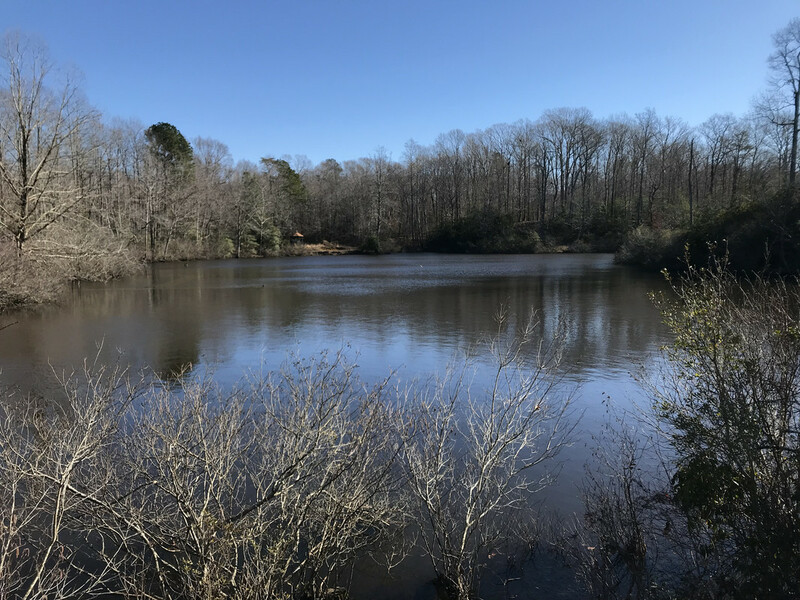 Last edited by Powhatan on Wed Feb 27, 2019 10:20 am, edited 2 times in total. Just spent an hour reading your lawn journals. Great job. Motivated to try some KY31! 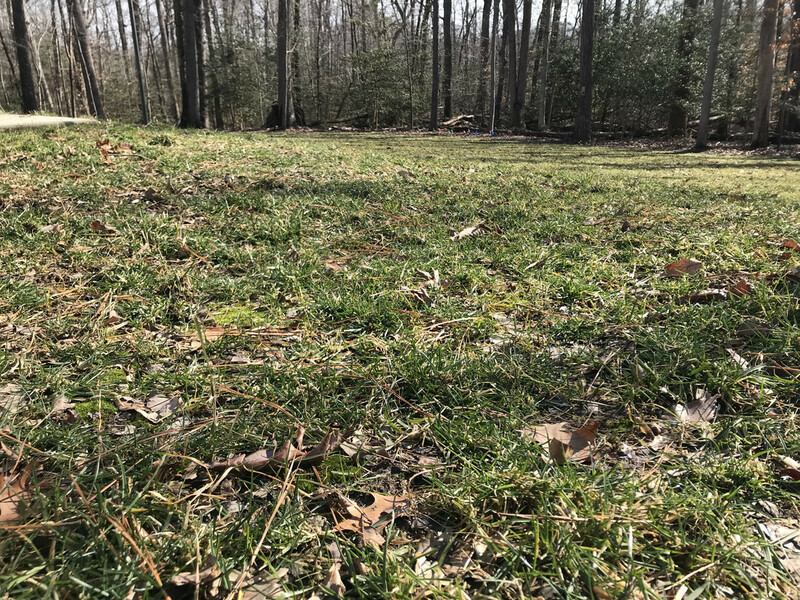 I admit KY-31 is not for the typical residential urban lawn, but it can be a good grass alternative for those that want to have a low maintenance turf. If you buy KY-31 from Tractor Supply, buy the DLF green bag (coated) Oregon grown, as that has a lot less weed seeds than the white bags that are non-coated. Also, I've noticed the Missouri grown in either green or white bag usually has more weed seeds than the Oregon. I know there are online vendors that sell KY-31 but I don't know if what they sell has less weed seed amounts. Sun is out and it's feeling like an early spring day, but the soil isn't quite at the right germinating temps yet. 2" depth - 43F in the shade and 47F in the sun. 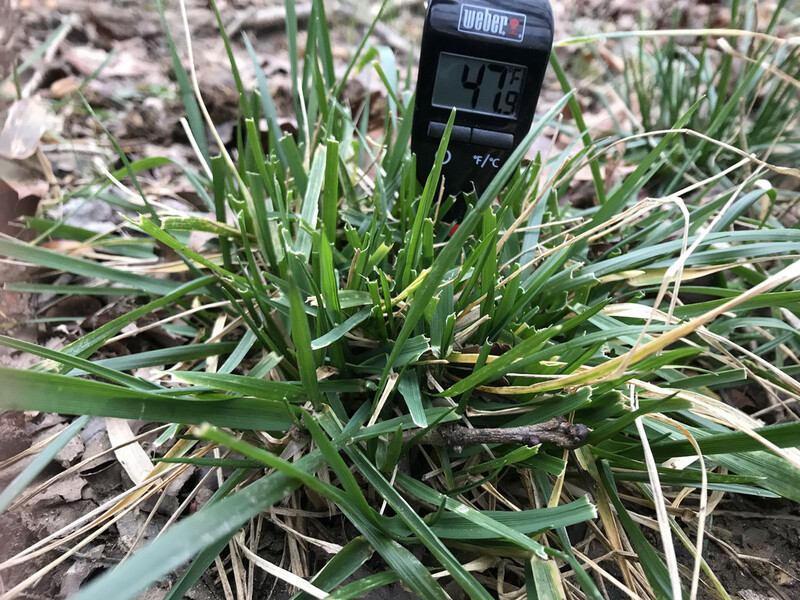 We've had plenty of rain showers, the ground is slightly moist, and the grass seeds are waiting for the right temps. I've seen several Canadian geese formations flying north. Raccoon, opossum, rabbit, deer, and wild birds have been visiting the yard looking for a snack. I raked some leaves from the nearby woods and placed around the lawn's bordering trees. It's free and natural mulch, returning nutrients that the tree grew. No need to worry about potential contaminants from store bought mulch. 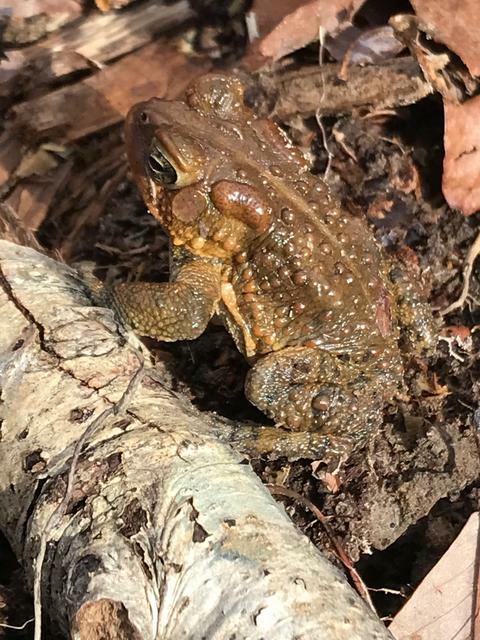 Southern Toad on the move, Spring is mating season. Ain't s/he a cuitie. Last edited by Powhatan on Tue Mar 05, 2019 11:58 am, edited 2 times in total. Wild birds been eating some of the overseed so put down some reserve KY-31/TTTF seed. First week of Mar is forecasted 40s/20s, then the warm up begins 60s/40s with rain showers. Hand-pulled weeds: several poa annua and some hairy bittercress starting to flower, fed those to the composter. The forsythia and daffodils starting to bloom in lower part of county. 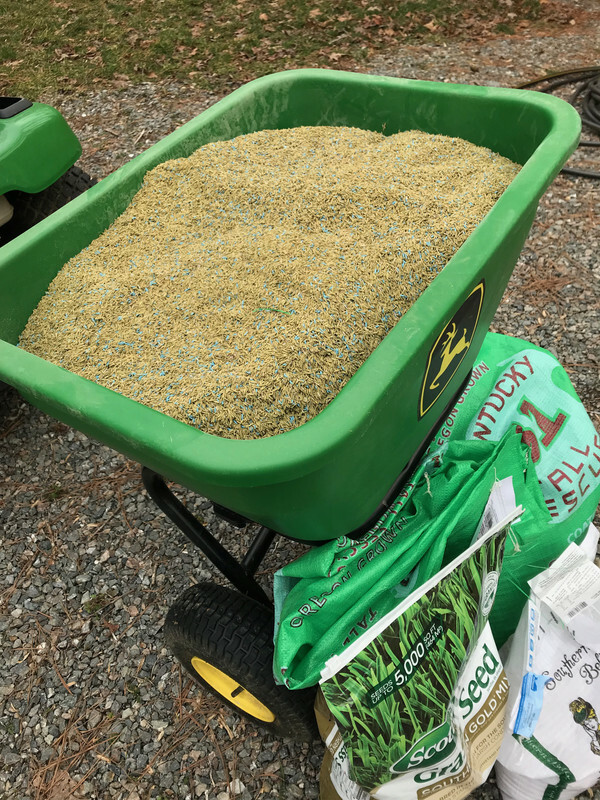 Put down 1st preM app (mesotrione) Scotts Starter Plus Weed Preventer 22 lb bag & 50 lbs alfalfa pellets. Soil temp 46F @ 2" depth, temp anticipated to be in 50s by middle next week along with higher air temps. Soil temp warmed-up to 53F. The mesotrione preM is starting to light up poa annua, I hand-pulled several and fed them to the composter. Received soil sample test results from Va Tech - pH 6.6, CEC 8.5, and OM 3.1%. P, Ca, and Mg at high amounts so no need to apply more, need nitrogen and K.
Starting to see grass seed germination. Soil temp 59F @ 2" depth. Native plant roots starting to sprout. Sprayed several orchard grass clumps with EcoLogic Weed & Grass Killer. Last edited by Powhatan on Fri Mar 29, 2019 4:34 pm, edited 11 times in total. Hey @Powhatan , I'm wondering what you are planning to do with that moss. Are you going to leave it alone? I've been adding lime to bring up the pH and OM to loosen the soil plus to hold more nutrients, and starting this season I plan to put down humic/carbon. I've trimmed up the bordering trees as much as I can, but I really don't want to cut any down unless they are dying. Most of the moss right now is growing near the house where there's usually some kinda shade. For the short term, I do have a bag or two of Scotts Moss Control I can put down. 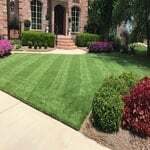 For the long term, I plan to put down Radar Chewings Fine Fescue around the shadier sides of house and yard. The "shadier" is a moving target throughout the year: different sun angles, tree leaves, and house blocking. But mostly the shadier areas are N, NE, and E sides of house. If the FF doesn't work, I'll probably have to put down some type edging such as gravel. Last edited by Powhatan on Tue Mar 05, 2019 10:11 am, edited 1 time in total. I have some moss to deal with as well. I don't think that mine is from pH. Tennessee had the wettest winter since, I believe, 1988. That, combined with shade around the foundation of my house, has generated a lot of moss. That Scott's moss control might actually be the sensible response for my situation, so thanks for the idea. I suppose that complications from shade is one drawback from having a property such as yours. I always feel like I've been in some kind of nature spa when I look at your pictures. Probably lowers my blood pressure, too.